Over the past month or so I’ve been working on a number of projects involving Windows Mobile Widgets. If you aren’t familiar with widgets they are essentially a mini-application published as a zip file containing html, js, css and images. They are similar to Windows Vista/7 gadgets; in fact so much so that you can use exactly the same code to produce both a widget and desktop gadget. In this post I’ll go through creating a basic widget, including a couple of tricks that can help you build and debug your widgets. We will of course start off with the canonical Hello World widget and for the most part I’m going to be working in Visual Studio 2010. That’s right, you can build and debug* your widgets from within Visual Studio 2010, which makes it the only form of Windows Mobile development you can currently do with the beta. When you install your widget the installer needs to locate the main html page of your widget, along with other information about your widget such as the author, title and description of the widget. This is located in a config.xml file. Add a new xml file called config.xml to your project (Add New Item –> C#/VB –> XML File) – the name of this file is important. Add, and then modify to suit yourself, the following to the config.xml file. You now have the minimum requirements for a Windows Mobile widget. If you press F5 to run this project in Visual Studio you will see the Main.htm web page display (if not, you may have to navigate to this page, or Set [it] as Start Page. 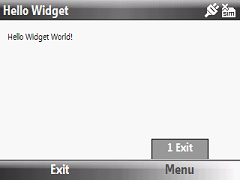 To run your widget on a device (or emulator) there are a few more steps involved. 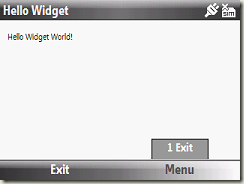 The first thing you need to do is to actually zip up your widget project into a .widget file. This is essentially just a zip file, renamed with the .widget extension. As you don’t want to be doing this manually every time you make a change I created a simple batch file (yeh I know, super old school) that simply calls 7zip (free download) to zip up the relevant files. Place this batch file in the parent folder of your Hello World widget – you don’t want to mess up your project folder with build files. You need to download and copy the 7zip executable into this folder and you need to create a file called files.txt – this contains a list of files to include in your widget. You can do this using either Remote Registry Editor (external tool that ships with Visual Studio 2008), Pocket Controller PC or another third party registry editing tool. Note that on most devices the HKEY_CLASSES_ROOT\riapp key already exists but the HKEY_CLASSES_ROOT\riapp\Shell\Open\Command key will need to be created. Also note that the @ in the second line corresponds to the “default” value for the key – this means that depending on your editing tool you should either leave the name component empty or use the word Default. Note that the Title in the Main.htm file is used to populate the widget title bar and that the default Exit button and menu has been created. Creating your first widget is as simple as that. In fact you could submit this widget, in its current form to Windows Mobile Marketplace as it conforms to all the necessary requirements for certification. *Build and Debug is limited to desktop debugging only. You still need to deploy to an emulator and/or a real device in order to ensure your widget is going to work correctly. Thanks for the step by step guide, it really helped me. Very nice post, i hope you can post more. It's great to find an author that understands their niche so incredibly well. I will be certain to check in again to see what is new.